Skeleton ship frames surround Au Sable Point, marking a mile-long sandstone reef that reached out into Lake Superior waiting to grab any and all ships that passed by. In an effort to end this tragic loss of lives, the Au Sable Point Lighthouse was constructed to warn mariners of its hidden reef. 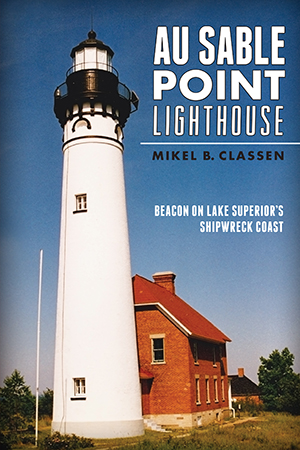 At the heart of the famed "Shipwreck Coast," Au Sable Point was a beacon of hope and safety. Mikel B. Classen charts the history of the lighthouse and the dangerous reef that waits six feet under the lake's surface and serves as the final resting place for so many sailors. A self-described "Yooper, " Mikel B. Classen is a long-time Sault Ste. Marie resident and author of "Lake Superior Tales." Over the last thirty years, he has worked as an author, journalist, columnist, photographer, editor and publisher. For twenty years he published "Above the Bridge" magazine, an Upper Peninsula regional publication. He is a well-established writer in the region and continues to maintain that status.